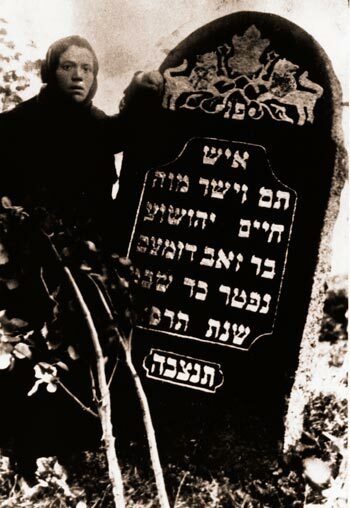 This is an old family photo of the grave of Chaim Yehushua Dumes who died in 1904. The grave still stands in the Jewish cemetery in Vishki. 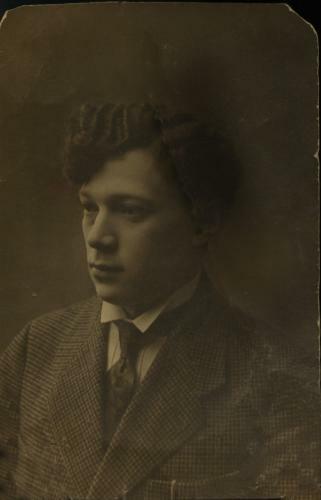 This is Wulf Dumesh (William J. Dumes in America), grandfather of Bruce Dumes, before he came to America in 1912. 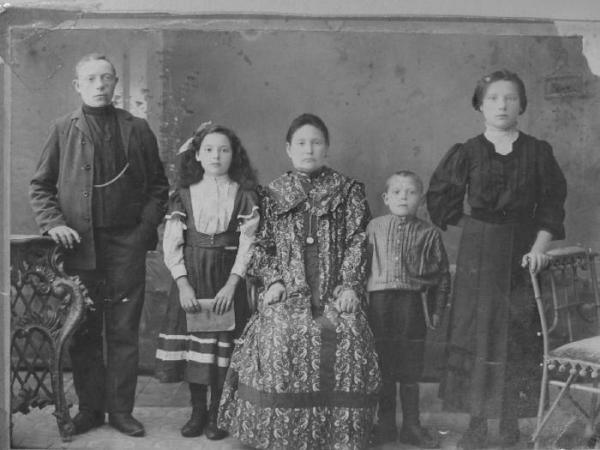 This is from Left to Right: Arthur (Artzik), Anna (Neima), Sheina-Freida (Sadie), William (Wolf) and Fannie (Feiga) Dumes, taken while still living in Vishki. The older siblings were already in America. 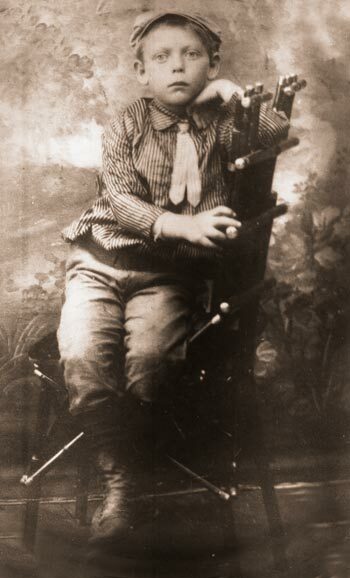 Vishki, about 1940. 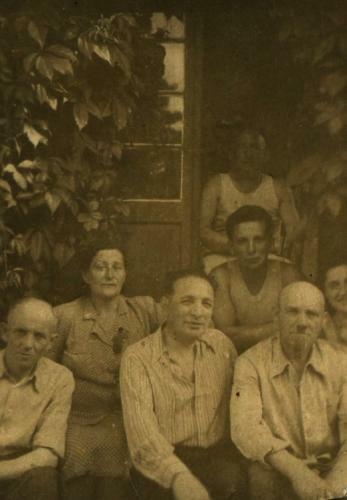 Upper row, from the left: Liba Dumesh, Tsipa-Lea Dumesh. Lower row, on the right, Doba Dumesh. All the others are unknown. Vishki 1949. Volf Usdin in the middle and Boris Usdin on the right. Dora Usdin, sister of Zalman. She was born in Vishki in 1886 and lived there her entire life. Vishki, 1950s. 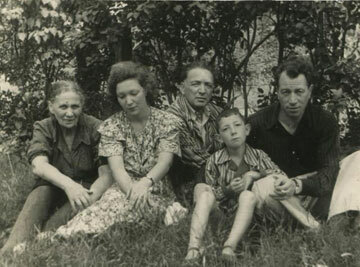 Dora, Sarah (who now lives in Toronto), Volf (who died in the gulag), Lev and Semien Usdin. Vishki, 1950s. 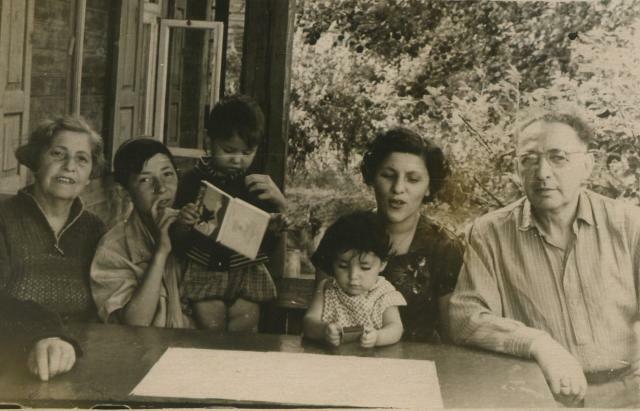 Yitsik Usdin and family in Vishki. 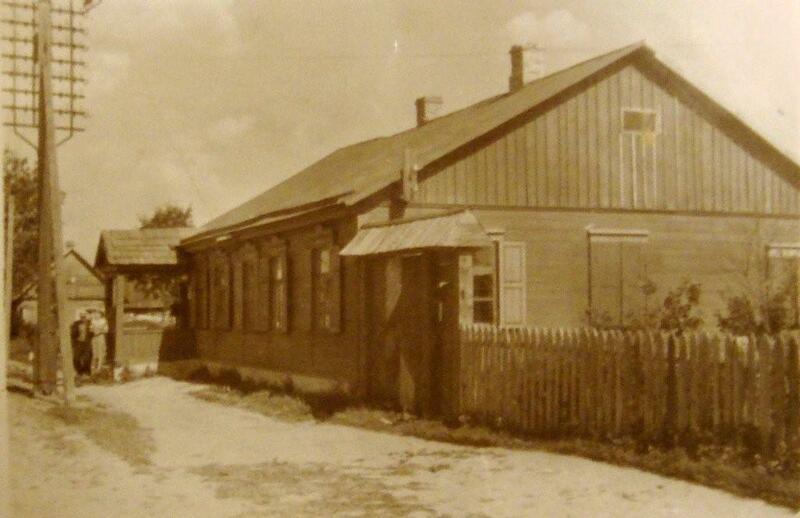 ~ 1953. Queuing at the store. 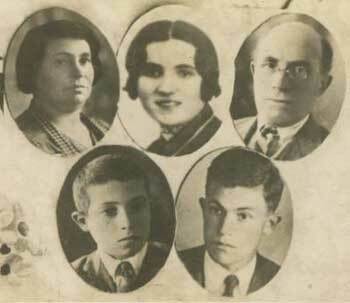 Julia Dumesh is 2nd from right. April 1953. There was a flood in Vishki, and the two lakes around Vishki flowed together. Circa 1953. Veronika Galvene (on the left) and Tanya Dumesh, second from left at Veronika's mother's funeral. 1954. The house of Israel Dumesh. This is where Tanya Dumesh worked as a seamstress. Tanya, Julia and Raisa Dumesh are on the left. The others are other workers in the shop. 1955. he market that took place on Sundays in Vishki. This is Market Street. 1957. Tirgus Street, also known as Market Street, as there was a market there every Sunday. The two columns on the right are all that remains of the synagogue of Vishki. 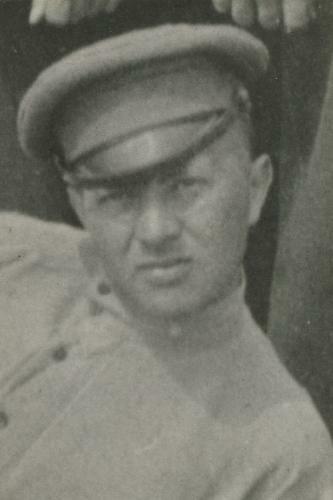 The wall in the background was part of the home of Leizer Dumesh. The girls are Raisa and Julia Dumesh. Vishki 1959. Volf Usdin in the middle and Boris Usdin on the right. ~ 1960. Tanya Dumesh's garden in Vishki. This is Julia Dumesh (on the right) and Tanya digging potatoes. 1961. Julia Dumesh's middle school graduation photo showing her school. ~ 1962. Aglonas Street in Vishki. Tanya Dumesh has a handbag and is wearing a nurse's uniform. The hospital, which is the white stone building behind her, was Boris Usdin's house. 2009. Julia Dumesh Aleskevica stands on the porch of her old home in Vishki. This house once belonged to her mother's uncle Israel. Her daughter Marina is on the left.